Our spotlight of the week is work style! Elle from Living in Color Style and I would love for you to share your work style looks! Come link up! I'm back to school today! I have super busy with back to school work! Sorry about the missing posts lately! Lastly, remember that even though our theme is work style this week, we welcome ALL fashion-related posts on this link-up! 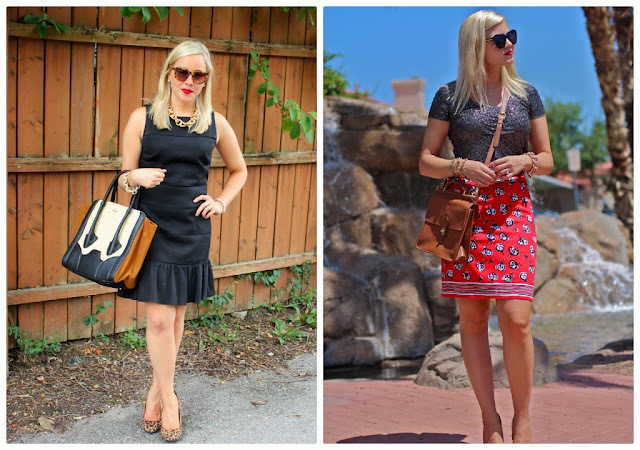 Spotlight: This weeks spotlight is Lauren from Style of One's Own. Elle and I love how Lauren incorporated color into this professional dress look. The pops of color are perfect to make professional dress more fun. Next week: Next week our spotlight weekly theme is Denim! See you next week! Thanks for linking up! Loving that LBD with the leopard pumps...you look gorgeous! Your dress is really pretty and fits you perfectly! Also love the touch of the leopard shoes. Love this, man.....work. Guess we're all back to it! Yep! Summer went by way too fast! Absolutely love the dropped waist of the dress! Definitely professional, yet chic. So glad I got this dress! It will come in handy! Love the idea of adding a jacket for fall! Thank you both SO much for the feature! :) Sorry I just now getting around to commenting. Work was crazy today. Great look! Love how that bag pairs with the shoes with the dress as the background. Thanks for co-hosting! Thanks Carylee! Love these shoes! Such a great deal! SUPER cute, you can't go wrong with a lbd! Love the fun shoes, they give the dress such a pop! Thanks Emily! Love these leopard shoes! oh my gosh, i love your bag sooo soo much!! Love your heels, your sunnies, your all black look, and you! I love your cute blog and adore this look!! i love that black dress...it's both professional and super cute and chic!! it's perfect with those shoes and great bag!